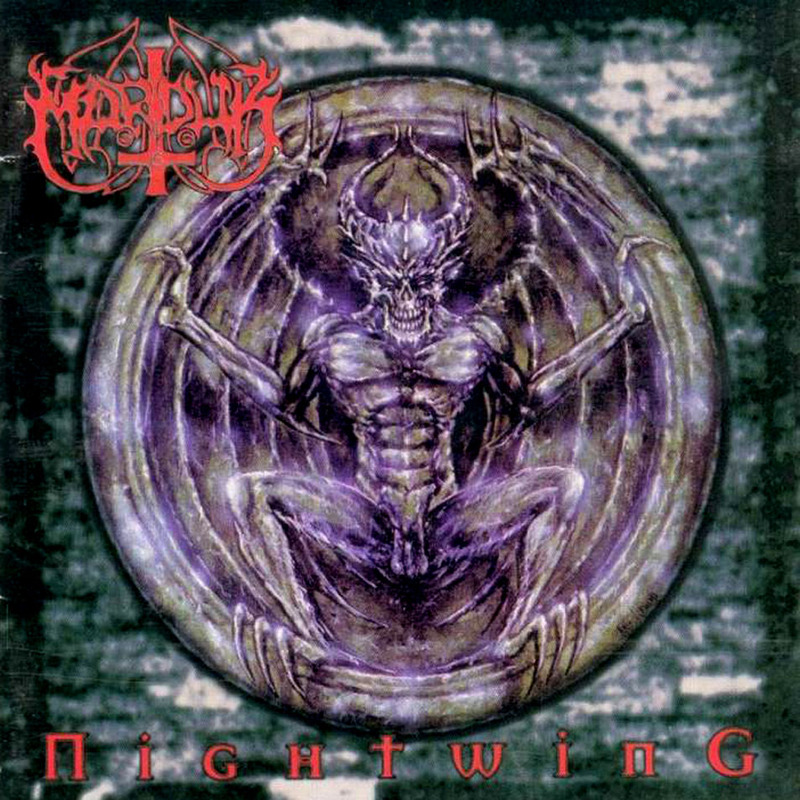 By the time “Nightwing”, the fifth Marduk album and second with vocalist Erik Hagstedt (Legion) behind the microphone, hit the market the band had become familiar with its new style. Released a year after “Heaven Shall Burn…” it is a continuation of that album’s sound with overall increased levels of density. The line-up remained identical from the preceding album, and that internal stability paid off dividends in terms of consistency, and performances from each of the members. While it does not quite have the same impact as it its immediate predecessor “Nightwing” is a reliable but unimaginative follow-up to a great breakthrough album. It is, however, the last good Marduk album for quite some time, as the band would fall into a rut and lose steam shortly after its release. To say that “Nightwing” is intense would be an understatement. The performance of drummer Fredrik Andersson borders on death metal territory considering the breakneck pace and percussive density he brings in said department. The bass-heaviness of Marduk’s early albums is carried over, and Bo Svensson (B. War) provides thick, oozing licks that propel the riffs from mainstay and creative force Morgan Steinmeyer Håkansson to the front all while holding down the bottom-end heaviness. Two albums into his tenure with the band Erik Hagstedt (Legion) delivers his last worthwhile performance, as his voice would rapidly deteriorate on the successors to “Nightwing”. Some of the lyrics reek of process and latter-day Deicide (say “Serpents Of the Light”) too with memorable passages as: “Slay the Nazarene / Die, die, die!” Both ‘Of Hell’s Fire’ and the aforementioned ‘Slay the Nazarene’ have particularly poor lyrics to go along with the highly efficient but hardly exciting Norsecore. Was a bit of eloquence and verbosity too much to ask in black metal at this point in time? The theological sub-branch of the genre was still a couple of years away from exploding – but other big name bands such as Ancient Rites, Dissection and Emperor were lyrically more ambitious. “Nightwing” is divided into two specific chapters. The first four songs encompass the "Dictionnaire Infernal", Marduk’s now patented attack on all things religious. Chapter two "The Warlord Wallachia", comprising of the last four songs, further fleshes out the Vlad Tepes narrative of the preceding record. ‘Nightwing’, the title track, is omitted from the tracklist altogether as it fits with neither chapter. “Nightwing” is the second part of the ‘blood’ chapter in an abstract tribute to Bathory’s landmark 1988 “Blood, Fire, Death” album. Further records include the preceding “Heaven Shall Burn” (blood), “Panzer Division Marduk” (fire) and the duo of “World Funeral” and “La Grande Danse Macabre” (death). In retrospect it makes the albums part of the movement a lot more interesting as up to this point in time Marduk changed a lot musically, but the way they structured their album has remained identical from yesteryear when they were a death metal band. It is no surprise that there are more cinematic references to this album than you’d initially expect. That Håkansson loves cinema in its many forms is no secret, and “Nightwing” is littered with references in that regard. The spoken intro to ‘Slay The Nazarene’ is taken from the 1973 movie “The Wicker Man”. The main riffs of ‘Nightwing’ were adapted from the score of the 1991 vampire film "Subspecies". The lyrics are also based on the plot of the movie. The album’s main concept (and entire second half) is dedicated to further detailing the historical account of Romanian warlord Vlad Tepes. While the concept was initiated on the preceding “Heaven Shall Burn…” the subject appeared at its earliest on “Opus Nocturne” with the track ‘Deme Quaden Thyrane’ which was re-recorded here. This was probably done for completeness’ sake, but also out of convenience because this meant the band needed one less new song to write to complete the concept. That ‘Deme Quaden Thyrane’ fits the slower direction is rather opportune, as Marduk didn’t went all out high-speed black metal until “Opus Nocturne”. The songs dealing with Vlad Tepes suffer from the same defect that made the “Heaven Shall Burn…” prologue a test in patience more than anything else. All these songs are directionless slow trudging cuts that work miracles in terms of pacing when they appear sparsely on each album. When taken back-to-back as the second half of an otherwise blisteringly fast genre effort they are poorly paced and constructed, supposedly epic songs to forward the Vlad Tepes narrative started two albums ago. Even in its death metal phase Håkansson never really excelled at writing slow material (‘Holy Inquistion’, ‘The Sun Turns Black As Night’ and ‘Within the Abyss’ excepted, if you are feeling charitable – or plainly adore that old dirgey death metal sound). Not only are these slow tracks horribly paced and constructed – they sit poorly with the preceding blisteringly fast tracks that serve to open the album. There’s no sense of journey with the narrative cuts, and Marduk’s musical frame is too limited (and limiting) to truly make something from these tracks. Since they had worked years to find their sound they weren’t going to revert back into their death metal form to make this work, which would have benefitted these tracks tremendously. Only ‘Anno Domini 1476’ sounds truly ominous and atmospheric in its eeriness, and this mostly due to the haunting choirs that appear sparingly and the militaristic percussion. Not only are these tracks listless and dull, they don’t sound very ominous either – which is the entire raison d’etre of black metal in the first place. Most of these tracks don’t build up to a climax, and what little there is of mentionworthy payoff isn’t worth sitting through most of them in the first place. Marduk, to its credit, is consistent and reliable in what it does, and how it goes about accomplishing its very specific objective. In an almost Mortician sense, Håkansson relies on the tried-and-true formula established on “Opus Nocturne” and deviates not an inch from what worked in the past. Once again the album was recorded at Abyss Studio in Sweden with much in-demand producer Peter Tägtgren. Whereas “Heaven Shall Burn…” had a smooth sounding production that was richly textured in its digital gloss, “Nightwing” instead comes with a hostile concrete-and-steel sounding death metal production job. In fact this is the type of production that I’d wish Kataklysm’s “The Temple Of Knowledge” had. It’s certainly a headscratcher to see a black metal band do a death metal production better than an actual death metal band. The artwork by Belgian painter Kris Verwimp and Swedish artist Stefan Danielsson fits the early catalog. After this record Marduk would go into a different direction visually. “Nighwing” is a sturdy and reliable Marduk album – but its early death metal direction was plainly better. 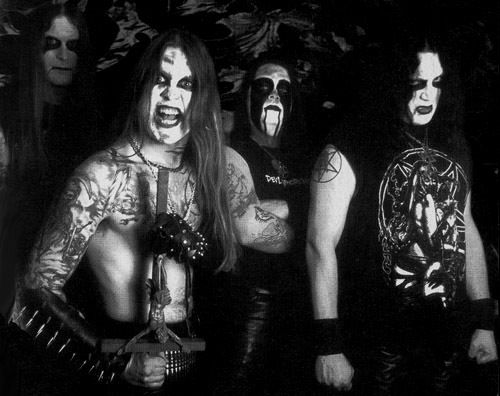 “Opus Nocturne” is the band’s third album, and the transitional record in Marduk’s ongoing transformation from a particularly minimalistic and barbaric death metal band into a black metal one. Where the preceding two albums saw the band differentiating itself from the burdgeoning death metal scene through its usage of eerie melodies and tortured vocals, here Marduk fully transition into its newly adopted style. It is the recording debut for drummer Fredrik Andersson and the last for singer Joakim Göthberg. Andersson is pivotal member in the band’s stylistic transformation into its known style. Andersson for his percussive dexterity and Göthberg for introducing a raspier, serpentine vocal style compared to the preceding records. It also is a just a strong death/black metal album. “Opus Nocturne” was the third of three efforts to be recorded at Hellspawn Studio (a later incarnation of Gorysound Studio before it changed its name to the popularly known Unisound Studio) with prolific producer Dan Swäno. “Opus Nocturne” is the foundational piece where Marduk’s popularly known blast-centric sound first appeared. With only minor traces of the band’s death metal past accounted for, and sparse usage of atmospheric enhancements “Opus Nocturne” is the missing link between the band’s not too distant past and its immediate future. While the record for the most part lays the groundwork for the uniformly savage “Heaven Shall Burn…” there are several traces of the band’s death metal past. Some of the more straightforward riff arrangements and chord progressions reek of classic Swedish death metal, and Göthberg’s vocal style recalls Jon Nödtveidt (circa “The Somberlain”) on more than one occasion. The bass guitar is of critical importance in these cuts, and it doesn’t function as a rhythm instrument like it does in most underground metal units. At points it’s even hard to tell whether the bass guitar is following the guitar riffs, or the other way around. This thick bass guitar tone is beneficial to the overall experience. The title track is a less than three minute cut with light washes of keyboards while the guitar plays a sorrowful melody with basic rhythmic support from the drums. Towards the conclusion an almost romantic poem is recited by Abruptum and Ophthalamia member Tony Särkkä for maximum atmospheric effect. It is an interesting coincidence to note that future Marduk vocalist Erik Hagstedt (Legion) sang on the 1995 Ophthalamia album “Via Dolorosa” – and that he would be enrolled full-time in this band merely a year later. It is rather unfortunate that “Opus Nocturne” was the last album to use atmospheric enhancements with keyboards and church organs. ‘The Appearance Of the Spirits Of Darkness’ wouldn’t have felt out of place on an early Cradle Of Filth recording. Unlike many of their contemporaries Marduk never overdid these atmospherics, and when they appeared they were usually quite effective and haunting in their minimalism. For the most part Marduk has settled into its newfound faster style, but whenever slow songs appear they tend to be quite death metal-ish. It’s a difference from day and night between ‘Autumnal Reaper’ and ‘Materialized In Stone’. The former is a scorching ripper at inhuman speeds, while the former is a trudging death metal song that almost sounds like Unleashed were it not for the minimal riffing style. There are two instances of minor lead/solo work in ‘Sulphur Souls’ and briefly in ‘Materialized In Stone’. ‘Deme Quaden Thyrane’ is the earliest of the Vlad Tepes concept that the band would explore to greater depth on “Heaven Shall Burn…” and its successor “Nightwing”. Whether the band had planned this from the beginning remains to be seen. Pushing the vampire thematic further is the fact that some lines in the lyrics for the song ‘Materialized in Stone’ were lifted from the novel “Varney the Vampire; or, The Feast of Blood”, by James Malcolm Rymer (1814–1884), although authorship of the novel is also occasionally credited to British hack writer Thomas Peckett Prest (Thomas Preskett Prest, 1818-1859). ‘The Sun Has Failed’ concludes with over two minutes of sampled thunderstorms, which is the most pointless form of padding imagineable, and in no way adds to the song’s depth. That “Opus Nocturne” is an album marked by conflicting objectives and an obvious sense of duality that should be rather evident to anybody with a keen ear. The black metal playing and songwriting decisions stand in stark contrast to the rather standard bass-heavy death metal production of the time. It is rather surprising to notice that “Opus Nocturne” works so well despite its apparent duality and conflicting production. It is in no small part thanks to Håkansson’s now solidifying riffs and chord progressions that the album works as well as it does. No longer do the songs carry excess baggage in introductory riffs or stomping chords. No. These songs are as lean, minimal and barbaric as they come. Everything that stands in the way of direct impact has been excised to make way for a more straightforward and visceral writing style. It’s rather telling that Mayhem, the supposed vanguard of extremity and innovation in the black metal scene, ended up imitating a relative newcomer like Marduk with an EP in 1997. It is rather unfortunate that a lot of the times Roger Svensson’s bass guitar licks are far more interesting than the riffs they are supporting. Marduk like no other understood the importance of bottom-end heaviness which they, through out the changes over the years, never abandoned. Marduk is beefier than most contemporary death metal bands. “Opus Nocturne” was the last of three albums that Marduk recorded at Hellspawn Studio (a later incarnation of Gorysound Studio before it changed its name to the popularly known Unisound Studio) with producer Dan Swäno. The band has lost none of its bass-heaviness, although the guitars are crispier but far thinner than before. The drum kit, especially the snares and toms, sound far cleaner than before, and thankfully the kickdrums sound as massive as before. In many ways this is how the Dark Funeral debut should have sounded, and like it was probably intended by its creators. “Opus Nocturne” was released in 1994, a full two years before “The Secrets Of the Black Arts”, the first Dark Funeral album. 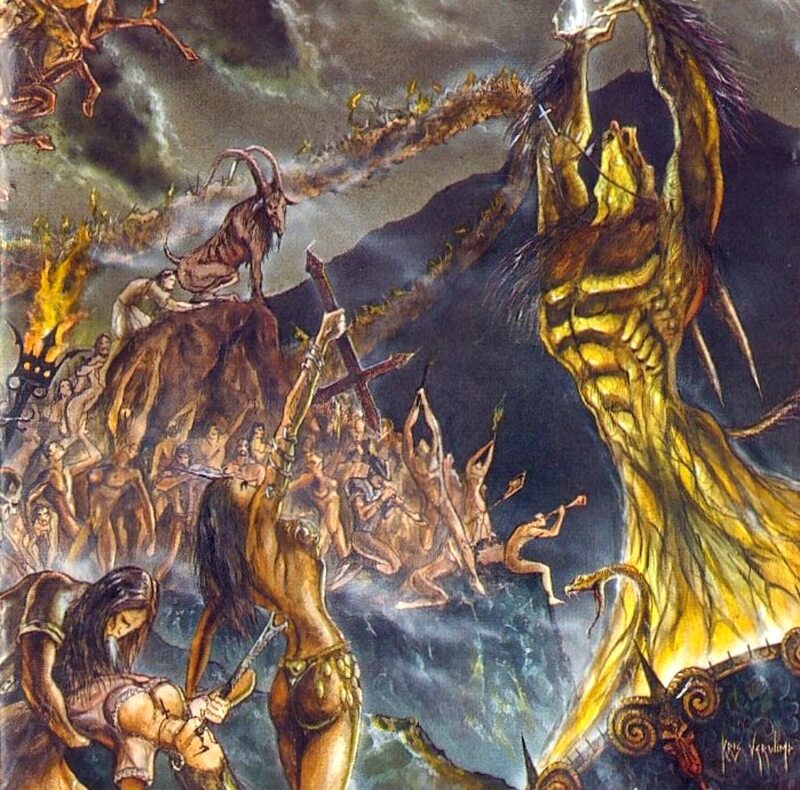 In that sense Marduk influenced not one, but two historically important black metal bands, which is something they never seem to get credit for. Göthberg’s swansong with Marduk reveals his limitations as a vocalist, and the band did right in replacing them with the savagely intense Erik Hagstedt for the next album. Håkansson’s typical melodies start to surface more, and the new rhythm section pushes the sound into further regions of extremity. “Opus Nocturne” is where Marduk shed the last vestiges of its not too distant death metal past, and fully embraced its new sound. The artwork by Belgian painter Kris Verwimp helps sell the band’s unholy vision. The third Marduk album is the defining moment ushering in the second era of the band. It is here that Morgan Steinmeyer Håkansson’s vision for the band finally came together. Everything works in unison, and each of the members gives an exemplary performance in their respective slots. An aura of desolation enshrouds much of this album as there are plenty of sorrowful melodies to be found, and the title track even borders on doom metal territory, albeit a very mild form of the genre. ‘Deme Quaden Thyrane’ even sets up the next two albums from a conceptual point of view. There’s a definite sense of finality to “Opus Nocturne” on many levels, and that is fitting, as it is the concluding chapter of the band’s first phase. It is the last recording before the band became a brand. On its subsequent releases Marduk would lose its rebellious edge and replace it with rigorous professionalism as the band became a fully functional touring/recording unit. As the definite high point in Marduk’s early career, it is a figurehead that even they themselves had trouble living up to. The glossy follow-up “Heaven Shall Burn… When We Are Gathered” only excised the atmospherics, and “Nightwing” went for a more concrete death metal production job – but the template for both was “Opus Nocturne”.